﻿ Wrought iron sign brackets for hanging signs. Traditional & contemporary sign hangers. for many years. These brackets combine functionality and aesthetics - practical and attractive. We have made signs for over 20 years now across the south and west of England. A hanging sign bracket requires several fixing points and they need to be some distance apart to give lateral stability. For larger some signs we offer additional outriggers to ensure the brackets stay rigid. if you let us know the dimensions and style you would like. are both aesthetically pleasing, robust and practical. We accept debit and credit card payments online and over the phone. Carriage from £12.90 to £16.90 + vat per unit is in addition to the stated prices. email us your details for consideration. We offer a professional sign design service for all types of suspended signage and include a free scale drawing for your approval. Projecting sign brackets are our speciality. 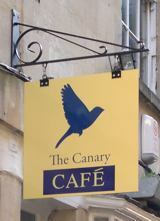 A colourful café sign fitted to a projecting hanger, a Master 610 wrought iron bracket. Your best resource in the UK for wrought iron hanging sign brackets.